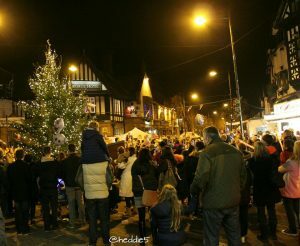 Details have been revealed for Crosby Village’s annual Christmas Lights Switch on and Festive Fair. 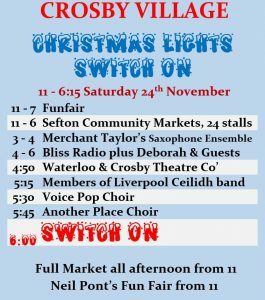 Taking place on Saturday November 24, the incredibly popular fun day starts from 11am with a children’s funfair that runs throughout the day and into the early evening, while 24 local market stalls from across Sefton will be selling a selection of Christmas treats and presents until 6pm. At 3pm Merchant Taylor’s Saxaphone Ensemble will start serenading the crowds before Bliss Radio take to the local airwaves with special guests from 4pm. A performance from Waterloo and Crosby Theatre Company follows at 4.50pm and they will introduce members of the Liverpool Ceilidh band at 5.15pm. The music continues with the Voice Pop Choir and Another Place Choir taking to the stage from 5.30pm and 5.45pm respectively. Make sure you find the best spot for 6pm when the big Christmas Switch on countdown begins and Crosby Village is bathed in the glow of festive lights!